Even though Netflix is about to horn in on GameFly's territory, the latter isn't too worried about the competition. Netflix has been having a tough time lately, between the hostility it received for its recent price hikes, the droves of people who are reportedly abandoning the service, and the hammering its stock prices are taking. Part of the company's plan to address these issues is to split into two groups: Netflix, which will handle streaming video, and Qwikster, which will take over Netflix's disc-mailings and include a game rental system. The latter sounds like it'll be horning in on GameFly's territory, but GameFly has revealed that it's not at all worried about the competition. 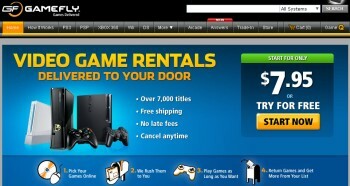 "GameFly has expanded steadily over the past nine years by focusing exclusively on video gamers. We are the only retailer offering games physically and digitally for both rental and purchase. "Gamers can try before they buy, choosing from new releases and classic titles that span the last decade. GameFly has more than 8000 games for 10 console and handheld systems to choose from, and over 1500 Windows/Mac games are available for download." The representative also made a point of mentioning that GameFly has managed to thrive, in spite of other competitors like Redbox and Blockbuster kiosks - not to mention Blockbuster's failed attempt to muscle in on GameFly's territory. GameFly certainly has a loyal customer base, not to mention its near-decade of success, but whether or not the service is able to survive Qwickster's presence unscathed remains to be seen. Still, one certainly can't fault the company for a lack of confidence.